I have one pair of sunglasses and they are the same style I have always worn. Oversized and black. I've been wanting to venture out of my sunglasses comfort zone but I'm just not very adventurous. I always see different styles on friends of mine or other bloggers and end up with sunglasses envy but when I try them on myself I flee back to my favourite style.. Here are a few styles I have been looking at. The pair I have now are from Coach so I was drawn to the Abigail pair. A few of these are out of my budget (obviously) but a few of them are within it and I really like these specific styles. I have been meaning to buy a pair of sunglasses for a few months now but I have been doing most of my shopping online these days so I ended up just browsing Smart Buy Glasses. 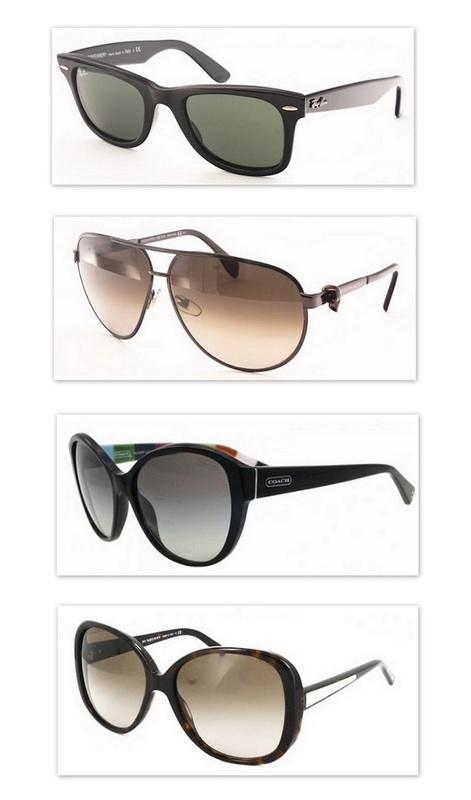 They have quite the selection of designer sunglasses so it's made looking for a new style easier. I haven't purchased anything yet and I'm sure I'll end up browsing instead of committing to a pair. I'm not sure why I'm so apprehensive with new sunglasses. I will purchase a camera on a whim but I'll spend months trying to decide on sunglasses. Have I mentioned I rarely make sense? I think I may need some help here. Which style do you prefer? Any styles that you suggest I try out? I also crave for the rayban wayfarer and think would look great on you!